I am EXTREMELY PROUD OF YOU and equally happy! WOW!!!" America First Search & Abstract, Inc.
“I also have time for my clients. Actually, I'm as passionate about my clients and their projects as I am about my groups. As a consultant, I am incredibly fortunate to get to work on projects from a wide spectrum of industries. Every project provides new challenges for finding ways to manage data, streamline and automate. I'm their partner and it is important to provide cost effective solutions. With the savings and benefits, my solutions typically pay for themselves in a matter of months. ... You provided an incredible contribution Teresa! The very fine interview clearly demonstrates your passion, experience, insights, commitment, dedication ... It's also evident that you spent considerable time in thinking about and providing your responses. Your hard work and focus on value is very much appreciated. In fact, I feel so inspired by your efforts! Thank you for taking the time and special care with the interview and sharing your considerable insights with the world. You are a very talented and gifted person who touches the lives of so many. Moreover, you are making a significant historical contribution to our society, industry, and profession. The world is like spiders web, you touch one corner and the whole thing shakes. And such is your personal vision, voice, and work -- you touch all of us and impact our vision and lives for the future. and you'll be good at it. I enjoy helping others, both professionally and personally. So it is a natural fit for me to direct my energies into helping businesses to succeed, leading the Access developer groups, raising money for Spinal Cord Society, being with my family, and helping my friends and colleagues. I offer consulting and mentoring for project management, database development and business solutions. Working together, we will look at the big picture, define the critical needs, and stay focused on the goal. With over 30 years of automating office tasks, managing projects and running my own company, I've learned what it takes to lead a team to success. for a teen clinic in Uganda, as a pro-bono project. w Becoming an NQA-1 certified lead auditor. You can leverage my expertise and experience to create cost effective solutions that are right for YOU. An incredible week of exchanging ideas and learning gaining insights into future technologies from leading experts from around the world. I had the privilege of giving a presentation on project management techniques and skills. For the past few years, much of my time and energy have been devoted to my Mom. She was a remarkable woman, who taught us to be good to others and to take responsibility for ourselves. Your support and compassion have helped immensely, so I thought it would be nice to share some thoughts and recent photos of Mom and me. Papa is what many would call, the salt of earth. On June 22, 2012, I had the distinct honor and pleasure of joining him to celebrate his 90th birthday. more successful and more fun. By Teresa Hennig, Rob Cooper, Geoffrey Griffith and Jerry Dennison. Supported by a remarkable team of contributing authors and editors: Armen Stein, Jeff Boyce, Albert Kallal, Doug Yudovich, Ben Clothier. Tips contributed from our esteemed colleagues Dane Miller, Garry Robinson, Steve Schapel, and Larry Strange. Please contact Teresa for a signed copy -- or order from Amazon with Teresa’s link. Review: "I have to say that you have surpassed yourself with the Access Programmer's Reference this time. Very, very nice. I usually use books like that for reference, to look up stuff when I have a question, but in this case I have literally been reading it in large chunks and finding it hard to put down. Especially the new Access 2010 functionality, I have already learned heaps. Our Book on Database Models! This book has extensive coverage of an area vital to Access developers and power users, by a very knowledgeable team, ably led by Teresa Hennig. It includes something more than an overview explaining new features of Access 2007. That is important because: many features are new and changed in Access 2007, much of what we do with VBA is automating and enhancing features we use manually via the user interface, and the new Office 2007 user interface can be overwhelming without a helping "hand up". 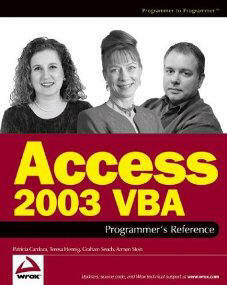 Then the book covers VBA from the basics to in-depth advanced levels. 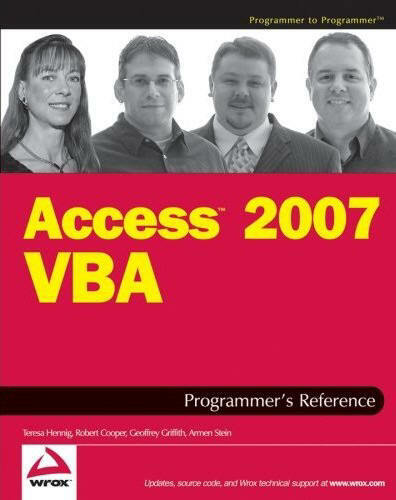 It is a worthy successor to the Access 2003 VBA Programmer's Reference and, in my opinion, "raises the bar" for VBA books. I'll be using it as a reference in presentations to my Access user groups, as well as a handy reference for my own work. I recommend it to Access power users, as well as aspiring and working Access developers. Your practical examples and anticipatory comments make this manual a valuable learning experience. You not only care about conveying useful information, but have the necessary practical experience to be a trustworthy guide regarding design options. This is the greatest recognition in my professional career. It is an incredible honor have earned the privilege of continuing with this elite group of professionals who are dedicated to helping the Access community. To all my friends, associates and readers ... Thank you for allowing me this opportunity to further leverage my energies on your behalf. 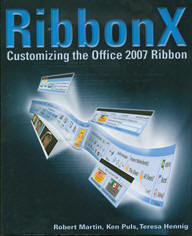 Our 2003 Book is Still a Preferred Reference! As the Coordinating Lead Author, I was privileged to create a team of four co-authors and include some excellent developers as contributors. Many thanks to Randy Weers for sharing his expertise and making this such a fun project. What benefits do they have for businesses? Many new clients would have some idea that a database could help them run their business, but they wouldn’t know where to start looking. And now, the abundance of information and opinions is so vast as to be overwhelming. So, if you are among the many who are looking for basic information from someone who makes a personal investment in every project, then this site is for you. Sections included in this site are under the headings of as answers to simple questions, the benefits of using databases, why getting customized, professional help may be your best choice, the use of databases on the web or intranet, and Teresa’s favorite links. And you do not want to miss the valuable information in the About Us section. This site is optimized for the most recent Internet browsers. And although we are experienced with Microsoft Access and Microsoft SQL Server databases, most of the information given here applies to all types of databases. remember to celebrate them all! The 2008 SCSNW golf tournament provided a new fund raising challenge. and there weren't that many buyers. The theme was black, white and silver, so I dressed the part, sans top hat 'n tails. The wine sets raised over $4,000! and we raised another $4,000 from photos & pledges. 220 miles representing 22 years in a chair! This 2006 fund raising effort was dedicated to my brother, Kirk Hennig, who has been a quadriplegic since a freak construction accident in 1983.
for research to cure paralysis. July 9 2004, I made it to the summit of Mt. Rainier!! for the American Lung Association of Washington. A database is a collection of data. An address book or a phone directory are well known databases. Unlike one of these written or printed databases, with a computerized database you are not stuck with a single format. Not only can you search for a phone number, you can also search for an address, a first name, or whatever other data, or combination of data, is in the collection. Then you add the fact that a computer database is not restricted to only certain data like name, address, and phone number and you really have something. You can collect any data you specify, such as part numbers, order numbers, dates, or product prices. Sharing her thoughts and tips for how to be a successful leader, run effective meetings, help members, and motivate others. 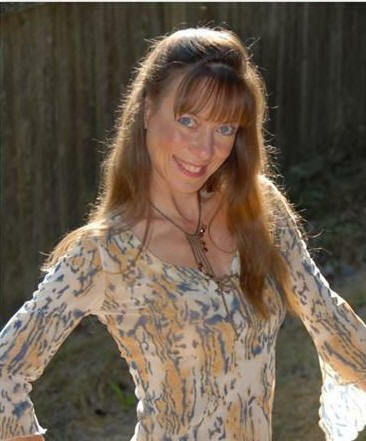 As well as her insights and expertise in business, consulting and database development. This blog is a MS Best Practice and is in the top 10% of their technet blogs worldwide!